There is nothing that soothes the soul more than a fabulous spa treatment and right now I am floating on a magical cloud after visiting the Kaya Kalp Spa in Agra, which at 99,000 square feet is a piece of pure paradise for beauty and wellness lovers. 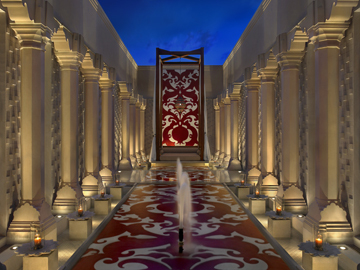 Situated in the ITC Mughal and billed as Asia’s largest spa, this majestic space offers a gorgeous trip down Mughal history (Agra was the Mughal’s prime playground) with stone latticework, mother-of-pearl inlays, marble floors, sparkling mirror-work and signature geometric patterns. 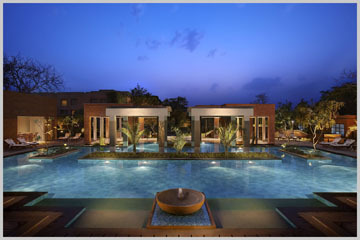 This mood is further heightened with lavish plays on greenery and water – two key elements of Mughal architecture – visible in the open air pool, fountains, outdoor rainwater showers, channels of running water, lush green gardens, orchard walkways, bird trails, a butterfly park and oases of palm trees that lull you into a deep tranquility. What strikes me first as I enter through the glass doors (feeling like I have stepped down a rabbit hole into another era altogether) is the all-pervading pomegranate theme – defying typical spa colours, the rich red of the fruit has been alternated with a soothing white throughout, be it on marble, wood or velvet. A ruby red pomegranate trellis runs dramatically along the wall and the ceiling, while the same motif is repeated in the white terrazzo flooring inlaid with red stone. In addition, the pomegranate’s antioxidant properties also make it a star ingredient in the spa’s signature treatments such as the Pomegranate Aromasoul Massage and Pomegranate Infusion Bath, which detoxify, revitalise and elevate the senses. The reason? This was Mughal Emperor Babar’s favourite fruit. 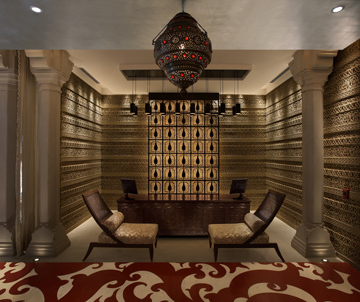 While Kaya Kalp includes a whole plethora of therapies, ranging from Thai Massage and the Monticelli Mud Wrap to Gem Stone Facials and Ayurvedic treatments, I gravitate towards the Royal Mughal Hamam – the first luxury hamam in India. Here, the decadent journey has me lying on a heated marble slab, stripped of clothing, while the chamber is filled with steam and dozens of candles that dance through the haze, their light bouncing off tiny mirrors and creating rainbows. The treatment begins with a deep cleansing Persian-inspired body scrub, whose natural ingredients leave me with ultra-soft and clean skin. This is followed with an Argan Oil and Mung Bean Soap massage – a rich, foamy mixture is slathered over my body and then rinsed away completely, leaving my skin feeling silky-soft. Finally, a relaxing head massage releases all tension from my head and neck, ending with a shampoo and hair conditioner. Being cleansed, lathered, rubbed in this manner felt like the very embodiment of what a spa should be! Next time, though, I am going to go a step further and book myself into one of the hotel’s in-suite spa treatment rooms, which come complete with steam chambers, Vichy showers and plunge pools for private treatments. This is the fabled India that travellers from across the seas wrote about in their memoirs. After all, this is the place – fittingly positioned in the city of the Taj Mahal, the symbol of an everlasting love – to pay homage to what should be our greatest love of all: Our own selves.